When working with watercolors, you love the way the colors swirl in and out of each other, creating a beautiful canvas of rich tones. When it came time to replace the tile in your kitchen, you called on your love of watercolor paints for inspiration and began the search for the perfect match. Once you set your eyes on Golden Green travertine tile, you knew that you had found the perfect tile for your kitchen. The variations on the tiles make each square of travertine a piece of art; the background colors vary from olive green to tan and pools of rust and orange lay over top cream colored clouds. The tumbled finish gives the travertine a rustic feel that you love and the price fits perfectly in your budget. After you have your Golden Green travertine tile installed, you are sure that you made the perfect choice. 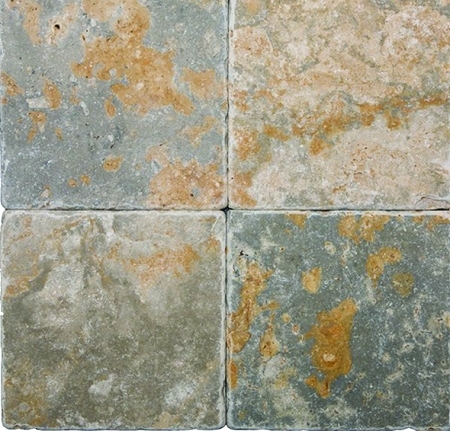 Golden Green tumbled travertine is ideal for both residential and commercial use. It works well for floors, walls, counter tops and shower walls.